Atlanta, GA: The Global Indian Business Council (GIBC) headquartered in Georgiaand the New Delhi-based Indo-American Friends Group (IAFG) co-hosted a networking dinner-discussion at the Staybridge Suites Atlanta Thursday, May 28, 2015. The networking dinner combined meaningful presentations on the US Government’s new Immigration reforms and initiatives in encouraging business investors to bring funds and jobs to America; on need for pragmatism in Indian taxation laws; and on support for the ‘Make In India’ initiative as envisioned by India’s Prime Minister Narendra Modi. The presentations were followed by IAFGs annual awards ceremony recognizing leaders for promoting and supporting friendship between the world’s largest democracies. IAFG’s 14th Foundation Day awards this year inAtlanta honored leaders from business, professional, social and cultural arenas for their outstanding contributions to humanity. GIBC members/executives met with IAFG’s visiting delegation of over 25 members and identified their commonality of purpose and agendas to benefit the trade and commerce endeavors. GIBC is a network of business and technology leaders across the globe working to promote and facilitate cooperation in trade and commerce betweenIndia,USA, and the rest of the world. IAFG promotes India-America friendship and help facilitating investors seeking to do business inAmerica, as well as to assist American investors seeking to do business inIndia. GIBC VP Ashwin Patel and IAFG Chairman Dr. Ajai Prakash Misra pointed out several business sectors where GIBC and IAFG could strive to complement each other’s efforts for the good of the society. The evening got underway with the traditional bouquet welcome as the Master of Ceremony Subash Razdan (GIBC VP as well) introduced and recognized the delegates and the dignitaries present. President-Elect Dhirendra Shah articulated the purpose and rapid growth of the GIBC organization since it’s founding a year ago. The inauguralAtlantasymposium in November 2014 laid out a vision and a strategic plan that was successfully launched. A US-based delegation was encouraged by GIBC to participate in the 2015 Pravasi Bharatiya Divas followed by ‘Vibrant Gujarat’ events in January. Both the events in Gandhinagar were well attended by delegations and leaders across the world. An Indian chapter of GIBC with a new office was inaugurated in InoCity, Ahmedabad. That office has already commenced programs with participant companies. GIBC strives to use the opportunity generated by the ambitious new programs of the new Indian government to drive business growth globally with focus onIndia. Introduced by IAFG Director and Atlanta Global Mall CEO Shiv Aggarwal ofAtlanta, Chairman Ajai Prakash Misra described IAFG as a friend of the Atlanta Indo-American community. IAFG has done sterling work in facilitating Indian business people to develop contacts and access to invest inAmerica, and vice versa. IAFG announced plans for Kentucky-based agriculture machinery manufacturers to export to and build inIndiaafter the recent visit of theKentuckydelegation toIndia. Acting Consul-General ofIndiathe Hon. R. Srinivasan once again admired the GIBC initiative during his address. He remarked how organizations such as GIBC made his own job easier by bringing our two nations together. The Consulate has staff specifically tasked to help people inUSAto deal and help with issues of trade, commerce and business formalities. Former INS (now called CIS)-Atlanta Director the Tom Fischer made a succinct and precise presentation on theUS“Immigration Pyramid” structure and processing schedules. He focused in detail on the EB-5 immigrant visa category, where investors who bring $0.5K to $1M “at-risk” new and well-documented foreign funds to the US and create 10 jobs here, receive a conditional green card, convertible after two years. On the other hand, L visas facilitate shorter-term stays of key employees in theUS. The IAFG celebrating its 14th Foundation Day (this year inAtlanta) announced their Pride of India Award to the Hon. John McDonough, City Manager of Sandy Springs, who graced the event with Mrs. McDonough. The keynote address by Mr. McDonough pointed toSandySpring’s record of rapid growth while keeping the city debt-free. Over $221M from savings has been invested on roads and other infrastructure, notably communications and information technology. Major corporations are relocating their headquarters and operations toSandy Springs. Mr. McDonough reflected on the tireless role of the late Mayor the Hon. Eva Galambos (predecessor of the Hon. Rusty Paul), in gettingSandy Springsresidents the right to vote (94% did) for independence as a city. Sandy Springs has set a standard for planned growth and major recognition such as the newest Indian Consulate, major US firms such as UPS, and most recently,Mercedes-BenzAmerica. 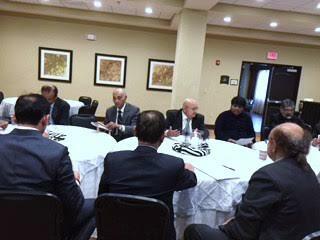 He thanked the former Indian Ambassador Ronen Sen for his willingness and the support of the Indo-Georgian community to locateIndia’s newest Consulate in the City ofSandy Springs. He also mentioned the role of the City in helping with the First International Yoga Day celebration inSandy Springson June 21. The next IAFG award was presented to Ashwin Patel, VP of GIBC, long-standing leader in theAtlantaandUSbusiness community. His social philanthropy includes a smoke free chula (stove) for rural cooking and his community service inIndiaas well as inGeorgia. 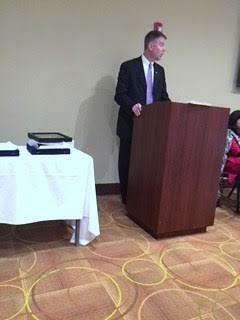 IAFG next awarded US 7th District Representative the Congressman Robert Woodall. Mr. Martin Wattenberger, Communications Director, accepted the award on the Congressman’s behalf. Congressman Woodall, a lawyer by education, has been a frequent guest at Indo-Georgian events, serves on the House Committee on Rules, the House Budget Committee, the House Transportation and Infrastructure Committees. Two more Pride of India Awards were presented in absentia to Dr. Bernice King, CEO of King Center (for promotion of the Civil Rights) and to Dr. Rahul Razdan, an Interventional Radiologist (for his breakthrough in research for using an ultrasound treatment for plantar fascitis) respectively. The past recipients of the Pride of India awards include Congressman Ed Royce (California) and Congresswoman Tulsi Gabbard (Hawaii). GIBC webmaster Prof. Narayanan Komerath (of Georgia Tech) pointed to the ‘expectation of excellence’ that Indian students continue to bring toUSAfor the past half-century, recognizing several alumni and students in the audience. His presentation, linked from GIBC’s website, compared basic features of the Indian andUStaxation as seen by individual taxpayers. AlthoughIndiahas made significant strides with electronic resources tailored to taxpayers inIndiaand abroad, there are still major challenges in rationalizing a myriad of corporate taxes. New legislation is expected to make radical improvements in the immediate future. Mrs. Priyanka Garg of Priyanka Garg Associates inFaridabadgave an enthusiastic presentation on Indian taxation that reflected the high confidence and optimism inIndia. B.R. Tripathi, retired Chief of Excise, spoke from his deep experience of the Indian Revenue Service. Delegate and well-known builder fromLucknow, Sudhir Shankar Halwasiya stressed the importance and advantage of cheap labor for the Manufacturing inIndia. Mr. Raghavenddhiraa from Bengaluru emphasized with passion on ‘Make inIndia’ and other initiatives that have begun to transformIndia.India’s unique demographics, with 65% of the population being under 35 years, are key to an optimistic future. Mementoes of appreciation were presented to Hon. Srinivasan, Martin Wattenbarger, Tom Fischer, Shiv Aggarwal and Prof. Komerath who made the networking event a success. In thanking the guests, the organizers and the media, Komerath pointed to the evident enthusiasm and the spirits reflected in the visitors’ presentations at the event after a long day of travel, as inspiration for everyone about investing in and collaborating with the newIndia. The GIBC evening culminated in dinner catered by Swapna Indian Cuisine/Madhu Tata, with support from Staybridge Suite staff and Ashwin Patel family, which lived up to the high expectations set, both in cuisine, service and conversation.